A very dear friend of mine and fellow blogger Sherry Valerie Hilles has just published two novels on Amazon. Sherry Valerie Hilles is an amazing woman. A mother of 7 children, she still manages to find the time to write novels, write poetry, draw and paint 🎨 beautiful pictures as well as being a very talented amateur photographer. Born and raised in the Malaysian province of Sarawak on the island of Borneo, she has a multi-cultural ancestral background- Malay, Iban (the Iban were the famous head hunters of Borneo in times past), Japanese and Chinese. In her late teens, she left her homeland to study at England’s prestigious Cambridge University. She now lives in the forests and mountains of Bavaria in southern Germany. I can honestly say that Sherry is one of the smartest people I know having an immense knowledge of history and literature, music and opera, art and sculpture as well as Greek, Norse and Egyptian mythology. Sherry’s tales of the supernatural are great at building up an atmosphere of terror in your immediate surroundings and her writing is so compelling and entrancing that whatever paranormal entity she is describing (be it ghost or demon), you get the absolutely chilling feeling that the entity being described is really and truly in the room with you. So if you really want to scare yourself out of your wits (thus giving you the qualifications necessary to be President in contemporary America), read her two Gothic Exorcist novels alone in a darkened room with all the lights off and only a single candle burning. These books would make great gifts for family or friends to have a scary Merry Christmas. Renfield R. Renfield was lying in his bed in the John Milton Blue Room (where John Milton and his daughter Anne once stayed) in a Bed and Breakfast in the town of Tewkesbury in Gloucestershire, England. Renfield was running as a British Transhumanist Techno-Progressive Anti Bio-Conservative Party candidate in the constituency of Tewkesbury In The Cotswolds. He was running against sitting incumbent British Conservative MP Agathor Christie (who was a great nephew by marriage of the famous British mystery writer Agatha Christie). Renfield would soon be involved in a campaign debate against Mr. Agathor Christie. As such, Renfield fell asleep dreaming about Agatha Christie’s famous Belgian detective sleuth character Hercule Poirot. 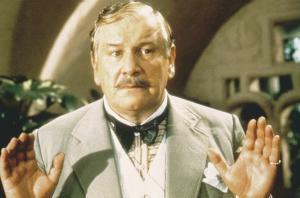 Hercule Poirot was staying in a huge mansion on a large English country estate. Hercule and 24 other guests were enjoying a huge dinner party (Monsieur Poirot would have given Renfield’s friend Amadeus Emanon a run for his money about who was able to eat the most). After the dinner, most of the other guests had retired to their rooms for this evening. Hercule himself was in the drawing room enjoying a cigar and a glass of port. Suddenly a gunshot was heard coming from upstairs. Followed by a woman’s scream. He was really starting to enjoy his port and his cigar and the comfort of his easy chair. Reluctantly the Belgian detective made his way upstairs to the crime scene. It was a little late for such instructions. One guest was already examining the murder victim’s head. Another was holding and examining the victim’s right arm. Guest #3 was holding and examining the victim’s left arm. Guest #4 was holding and examining the victim’s right leg. Guest #5 was examining and holding the victim’s left leg. Guest #6 (whom ladies at the dinner party referred to as “the trollop in the little red dress”) was undoing the victim’s zipper on his pants with her mouth. Guest #7 had picked up and examined the revolver lying on the floor. Guest #8 had picked up and examined the bloodied knife lying on the coffee table. The French maid was examining the open bottle of pills on the bedroom dresser. Guest #9 was examining the open bottle of poison in the medicine cabinet. Guest #10 had poured himself a glass of water from the pitcher of water on the reading lamp table and promptly keeled over dead after drinking it. Guest #11 was examining the hangman’s noose hanging from the ceiling. Guest #12 was examining the bloodied chainsaw lying on the bloodied carpet by the desk. Guest #13 was under a ladder trying to retrieve a black cat that was behind the ladder. Guest #14 was examining a bloodied samurai sword on the desk. Guest #15 was examining a pair of bloodied candlesticks by the fireplace. And Guests #16 to 23 were examining, handling and imbibing the bottles that were the contents of His Lordship’s private liquor cabinet. My 1st vampire novel The Vampiress With Amnesia is now available in paperback. Some of my friends outside North America have told me they are not able to access those links in countries in Europe and Asia. Hello friends and fellow bloggers, I just thought I’d let you know that my 1st vampire novel The Vampiress With Amnesia has been published and is now available for sale on Amazon. I have discovered from my friends outside North America that the above link doesn’t seem to work in countries in Europe and Asia. featuring the adventures of Canadian vampire hunter Dracul Van Helsing, South Korean vampire huntress Hyung Grace Kwan, shapeshifting hamster/human Renfield R. Renfield, genetically cloned concert pianist Amadeus Emanon, the ancient Egyptian vampire Set, the Aztec vampire princess Qonzilqointec and of course the vampiress with amnesia.